As I type this, my window is open, my son is asleep with his head rested on my lap, soothed by the gentle sound of summer rain drumming against the window while thunder occasionally rumbles in the distance. This past month has been particularly hot and humid and as much as I love summer and its romantic pop-up thunderstorms, I also can’t help but dread the way my skin reacts to humidity and heat. I know by now all too well that in summer many women suffer from oilier skin which is more prone to breakouts, and I am one of them. Every summer I bustle over my skincare, trying hard to keep my skin’s healthy and glow, while avoiding the excess of sebum and grease. Unfortunately, more frequent traveling and changes of climate and diet don’t make things easier. Throughout the summer I would suffer from a scarred face and skin bumps lingering for weeks, which inevitably affected my mood and even my self-esteem. So this year I tried something different that seems to have worked and, for the first time in years, I feel my skin is in a wonderful state of balance and health. Before I tell you what I’ve changed in my routine and summer skincare, I also want to give you a warning: there is no one universal miracle product that solves all skin problems in summer. Instead, I have done thorough research and tried many things and, based on that, I created my own approach that consists of several things that work in synchrony. For the first time this year I started using fermented summer skincare. Let me tell you why I decided to go for it by explaining the process of fermentation: fermentation is a process of detoxifying plants and enhancing the effects of natural ingredients by preserving the product over a period of time. This preservation process actually builds up nutrients so that after a while the product will naturally form amino acids, vitamins, and antioxidants. The active ingredients are also broken down by yeast so that they can be easily absorbed into the skin. The skincare benefits are tenfold: the increase in amino acids helps to deal with fine lines, antioxidants help protect your skin and fight free-radicals and also help to lighten and even out your skin tone. Another plus is that, compared to other kinds of skincare, fermented creams and serums are more quickly and easily absorbed. 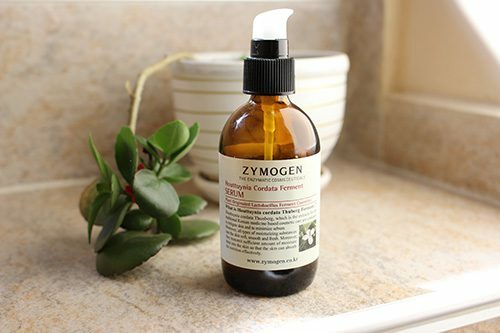 The product I have found after a long period of research is Zymogen Houttuynia Cordata Ferment Serum, which comes in a 105ml brown glass bottle with a push-down lid. The liquid is very light and thin; the consistency is more like water than a cream. This makes it super easy to apply and doesn’t feel heavy on your skin (that’s important for me especially in summer). It is also super hydrating and cooling when applied to the skin, very calming and has definitely played a part in reducing my acne and blackheads. What is also very important, especially in summer, is that the serum contains hyaluronic acid to give a boost of hydration to the skin. The other important ingredient is chamomile, a powerful herb known for its anti-inflammatory, anti-bacterial, anti-fungal, and anti-septic properties. Another interesting ingredient in this serum is licorice extract, which is also known for its antiseptic and anti-inflammatory properties, which helps to heal various skin conditions such as redness and inflammation. 2. Healthy skin is well-hydrated skin: it is very easy for the skin’s moisture levels to drop due to climatic conditions – heat, dryness, pollution, air conditioning, excess sweating – and lifestyle and eating habits such as alcohol, tobacco, and poor nutrition. All these have a considerate effect on our skin’s natural defences. In summer it’s particularly important to take care of our skin, like sunshine, high temperatures, and increased perspiration are all adding to the risks. So this summer I took extra precautions and started using a powerful hydrating cream which also contains green tea, a powerful antioxidant that helps heal acne and inflammation. My favoured cream is Superfood Air-whip Hyaluronic Acid moisture cream, great for oily and combination skin. I also started using face and hair mist to help my skin feel revitalised and well-hydrated. 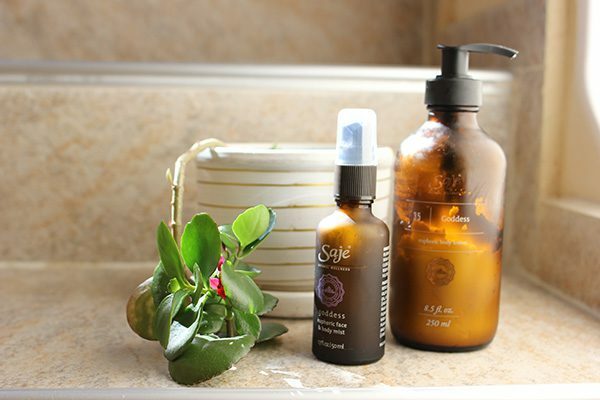 I chose Saje Rose Hydrating Euphoric mist which is very feminine and truly gentle. 3. Don’t forget your supplements. Starting in May I decided to tank on Antioxidants including zinc and selenium. Zinc is absolutely essential for beautiful skin because it is a key member of a group of enzymes that help the body maintain its collagen supply (collagen prevents wrinkly sagging skin – that pesky sign of aging) and it is important for hormonal balance. Zinc deficiency can be a root cause of acne and breakouts. 4. Watch your nutrition: cocktails, beer and wine, and spicy food are staples during the summer, but they are also oily skin culprits as they dilate blood vessels and increase perspiration. This year I am avoiding alcohol (this is not about stopping alcohol completely) and instead, I’ve increased the consumption of skin-healthy foods such as blueberries, whole grains, spinach, and peppers which are high in anti-oxidants and improve complexion. 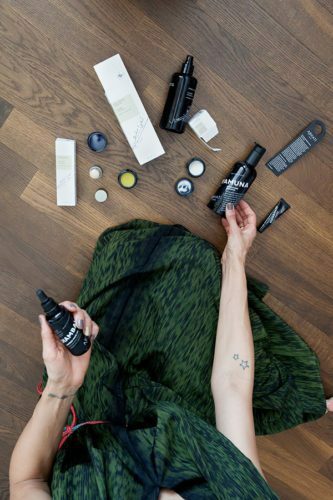 Don’t forget that in summer chill skin is happy skin: adding some adaptogens to reduce the inflammation and hormone surges that add up to skin issues. Every morning I would drink a hot brew of ginger with kurkuma or sip a fresh drink of orange juice, ginger and kurkuma throughout the day. Another herb I kept adding to my smoothies was parsley, which is well-known for its skin lightening properties that can help reduce the appearance of dark spots and discolored skin. The other fresh herbs with anti-inflammatory effects I am using a lot this summer are basil and savory. 5. Visit your beautician more often in the summer and try the Ultrasonic Facial Cleanser. Think of the ultrasonic skin scrubber as a device that wicks away dead skin cells, dirt, and grime. It is a small handheld device that vibrates ultrasonically. Ask your beautician or check online for home care devices. This is a magic treatment that keeps my pores clear from any blackheads. Another treatment I recommend to almost every type of skin is the Hydra Facial. It is the best thing you can do for yourself in the middle of summer. It not only cleans your congested pores, wrinkles and fine lines, but it targets hyperpigmentation too, AND quenches your skin’s thirst. It has an immediate effect, smoother skin, even tone and glowing face. 6. You may already know this but the sun destroys the collagen and elastin in our skin. That’s why it is important that we use some basic care such as hydration, collagen and elastin stimulation and strengthening. To some extent damaged collagen can be restored by the skin, but with age this ability slows down. Collagen can be stimulated from inside and out. This means you can take supplements such as collagen powder added to your shakes or use an organic plant collagen builder (I am taking one this summer). At the same time you can stimulate the production of collagen and elastin with different facial treatments: laser stimulation, chemical peels, radiofrequency, and microneedling (this last one done at home with a micro roller). 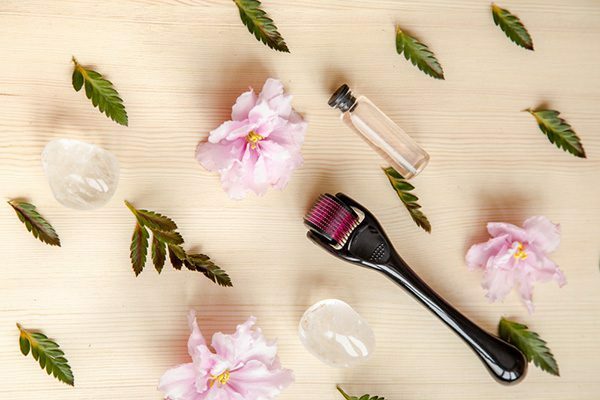 I do have a micro roller at home and this summer I’ve tried radio frequency, which stimulates collagen and has nothing to do with the proper hydration of the skin which is take care of with a Hydra Facial for example. It is important to know your skin need before you take any action. 7. Final reminder – drink more water! A little tip to encourage you to drink more water is that this summer one of the most popular drinks is herb- and fruit-infused water. My favourite one is made with pomegranate and peppermint, but you can choose any of your favourite fruits and buy an elegant fruit infuser glass pitcher or bottle. Don’t forget to book your spot for our End of the Summer Spoil Me Wellness and Shopping Day!